What a beautiful day! We went to the Harley Dealership in Janesville. DH wanted to show me all the bikes he saw last time he was out there with the neighbor. 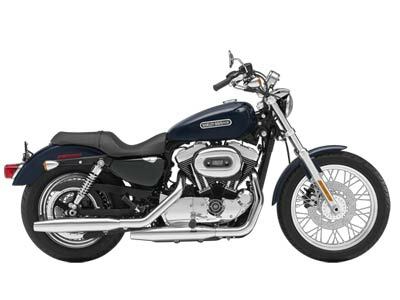 I picked out a gorgeous 2009 Harley-Davidson XL 1200L Sportster® 1200 Low in Dark Blue Pearl. Yeah, I can see me on ton of those. Maybe if I win the Lottery…I can always dream, yes? We gandered at all the merchandise, there were walls and walls of Harly-this and Harley-that, all very expensive. DH found a tall shot glass for his collection. He never uses them, they are all on wooden display shelves he has built for ther countless dozens. Friends always bring him a couple sets back from vacations, he loves getting them. I got Warren a new freezer mug to replace the one Igor knocked from his hand yesterday. He sent me an email tonight saying how happy he was to get the Harley one. His originally had a Michigan State logo on it, but heck, who wouldn’t like Harley Davidson?!? The ride home was absolutely wonderful-it was great to get out and not see snow everywhere you turned. The ride along Hwy A is laced with rambling rolling hills, interspersed with stretches of flat country farmland and well-worn farms every other acre. I couldn’t help imagining myself on the back of a Merlot FLHTCUTG TRI-GLIDE 3-wheel, the wind in my hair, and my knitting in my lap ~heck, I’d leave my knitting at home, for a ride like that! The weather was a bit nippy, but we weren’t out in it long enough to notice. Unfortunately, Igor and I had to forgo our usual walk, but maybe we’ll resume again tomorrow-it’s suppose to be nicer by degrees. Catch me if you can-zoooooooooooooooooooom!